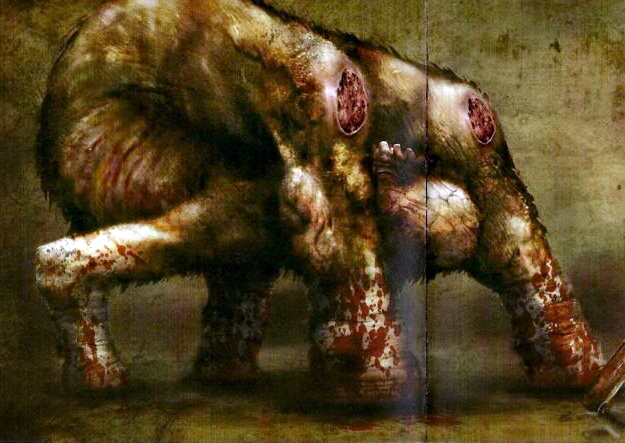 Silent Hill Heaven • View topic - A complete item guide for SH0 - desirable or useless? A complete item guide for SH0 - desirable or useless? Post subject: A complete item guide for SH0 - desirable or useless? Currently I'm playing through SH0 with the ambitious goal to find and document every single item you can collect. It's a first-time-playthrough without the use of healing items or Energy Drinks to make sure that I only document the standard items - not the additional ones that may spawn if you're running low on health or something like that. I've checked every single room, corridor and open area completely and very thoroughly: every single inch of a wall, an object, every plate of a floor, meter of a street and so on. As of now, I've finished the motel, and I've found more items in each location than any FAQ I know of mentions. The time I invested until now is about 80 hours in total. Originally I was going to do that for myself, but meanwhile I'm thinking about sharing it when it's done, so that it may help others and be of use to them. Now my question to you is: Would that really be of use to someone, especially with regards to the random-item-spawn-feature of the game? (Honestly, I don't know much about it, since I haven't played more than twice through the game, and I've never had a lack of Health and Energy Drinks; however, the item types I collected during these two playthroughs didn't differ from my actual playthrough - at least I feel so in retrospect). Do you wish for such a complete guide or are you satisfied with the existing FAQs? Post subject: Re: A complete item guide for SH0 - desirable or useless? I wouldn't use such a thing- usually the only online help I'll look up is for different endings, possibly a puzzle or 2 in new games. But since you're putting all that effort into the item mapping anyway, you might as well offer it online. Someone may find it useful at some point. For example, I got a friend of mine to play SH2 (which he never finished, but that's beside the point), and he got to a point where he found he just couldn't make it any further/didn't have enough supply items. He decided to start again and look for more items after I explained he needs to go out of his way to look sometimes, and tipped him off that James will turn his head to look at things. If someone needs to re-load an old save and look for more items to get them through, a guide like yours would be exactly what they'd need. So, finally, I've finished my item hunting! And I'm absolutely sure, that I fullfilled the description of the Collector accolade literally. I collected a total of 451 items, had to kill 244 enemies to explore everything, looked at the maps 941 times, walked 128,72 km (that huge distance resulted mainly in checking walls) and had a playing time of 88:48:24. Like I said, I completed the game almost without using healing items or Energy Drinks at all - only two First Aid Kits (I still need to improve myself on the penultimate boss ) - in order to eliminate the healing-item-spawning-feature I heard of, so that only the standard items would appear. I compared my own run with those of three other famous walkthroughs found on GameFAQs. The biggest item differences I've noticed were with a comparison of my run with a mapthrough whose author I believe must have used many healing items during his playthrough, because especially at the Hospital and the Sanitarium stage he had found several times Health Drinks instead of Energy Drinks, Energy Drinks instead of nothing, and later in the game First Aid Kits instead of ammo. The other two walkthroughs however almost always list the same items I've found. The only differences were at the Sanitarium stage, which I believe is down to the fact that players normally don't arrive there without having used a healing item or a melee weapon, and because of the relative small inventory at this early point of the game. That's why I made sure to arrive at the Sanitarium without having used anything, to keep my inventory at its maximum. During the stage, I searched unsuccessfully for two Health Drinks, two Energy Drinks, and one Meat Hook that one or both of the walkthroughs list. But at all the other places I've found the same as them - only one Hammer in the last normal Streets section was missing at my run. Those maybe could also be PS2-PSP-differences. Now to the item number comparison: I've found about 30 items more than the mapthrough (don't know if on PS2 or PSP), and about 10 items more than the walkthrough that lists the highest item number (on PSP); with the third walkthrough (don't know if on PS2 or PSP) I haven't compared my results in detail, but there were also many missing items I've found, like with the first one. To cut a long story short, I'm pretty sure that 451 is the highest number of standard items achieveable on a 1st time playthrough! And on a side note, what I also found out during this run: Unlike in some other SH games, Travis turns his head at every single collectable item - outside of buildings at about twice as much the distance than inside a building (but unfortunately, a couple of times also at things that aren't of any interest). Like I said above, I don't know if I will ever digitize it (depends on mind, time and demand), but in the next days, I'll post a statistic in any case - for those interested in how many items of each type the game contains.